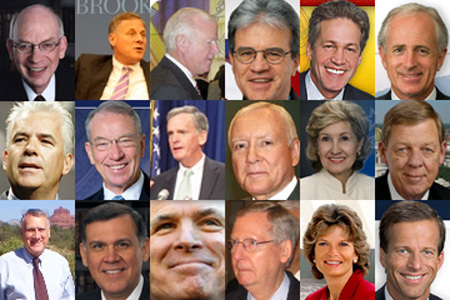 These 18 senators (all Republicans) are the people who voted for the 700 billion dollar no strings attached bailout to Wall Street, but voted against the plenty of strings attached 14 billion dollar loans for the auto industry that would prevent 12 million people from losing their jobs. I understand a principled opposition to all bailouts. But to give 700 billion dollars to crooks who tanked their companies by behaving recklessly while refusing to save the jobs of 12 million people who have NOTHING to do with their industry's downfall is a level of callousness that I really can't begin to imagine. I'm have more on the auto bailout at some point when I have more time am in less of a blind rage. If there were instant karma, these guys would be living in UAW made cars under a bridge this Christmas. If the auto industry collapses it would affect many many more jobs than just the ones with the official classifications. I got that figure from an estimation of the number of jobs that could be lost if the industry collapsed.I found it when I was at work, so I'll try and track that down the saw on Monday. For now the record this newsweek article and a few others site this report that calculated the auto industry supports 1 in 10 American jobs, a figure that would estimate the long term damage if they went under. The estimate for for the first year is that immediately 2.5 million jobs would be lost within the auto industry and other immediately effected businesses. Either way, it's effect is much much bigger than simply 830,000 jobs listed in the auto manufacturing industry (a figure which would also include non-big three foreign auto maker plants in the south, who would still be in business if the big three failed). It's my bad for not sighting the figure I used. Unlike the rest of my posts I just wrote this one quickly because I was so pissed off and wanted to put something about it up on the site.